Near- to above-normal precipitation during the past 30 days once again prevailed across the eastern half of the Nation, leaving only moderate drought in southeastern Florida, northern North Dakota, and small areas of northern and southern Texas. Since the Dec. 11 U.S. Drought Monitor, all drought was removed from eastern Oklahoma, southwestern Missouri, and northwestern Arkansas, and was reduced in northern North Dakota. In contrast, a few areas in the eastern half of the lower 48 States measured less than half of normal precipitation since mid-December, allowing for the development of moderate drought in south Texas and the persistence of D1 in north Texas and southeastern Florida. In the West, surplus 30-day precipitation across most of the Southwest (southern California, Arizona, New Mexico, southern Colorado) and near- to above-normal precipitation in the Pacific Northwest (most of Oregon and Washington) was enough for a 1-category improvement in parts of these States. Some regions, however, observed subnormal precipitation, especially in the north-central Rockies and High Plains, and some slight expansion of dryness and drought was made in northern Colorado, southern Wyoming, and central Idaho. Fortunately, 30-day temperatures averaged near to below normal, allowing much of the precipitation to fall as snow and build the basin’s snow pack and snow water content (SWC). As of Jan. 14, most major basin average WYTD SWC in the southern half of the West ranged between 80-110 percent of normal (basin average WYTD precipitation 80-120 percent), better than previous winters but not enough (yet) to make a serious dent in the long-term drought in the Four Corners Region. In the northern half of the West, basin average SWC was generally lower (60-90 percent), as was precipitation (65-90 percent). While the El Niño Watch was still in effect (65 percent chance that El Niño was expected to form and continue through the Northern Hemisphere spring 2019), the atmospheric anomalies largely reflected intra-seasonal variability related to the Madden-Julian Oscillation, and have not yet shown a clear coupling to the above-average ocean temperatures. However, the late winter and early spring tend to be the most favorable months for coupling, so forecasters still believe weak El Niño conditions will emerge shortly, but given the timing and that a weak event is favored, significant global impacts are not anticipated during the rest of the winter even if conditions were to form. With that said, late January into February is expected to feature a strong ridge over the West and deep trough over the East, with favorable odds for subnormal precipitation in the West (above-normal temperatures) and Ohio/Tennessee Valleys (subnormal temperatures). Similar precipitation and temperature patterns are forecast for FMA, except for a tilt toward above-normal precipitation in the south-central Rockies and Plains and along the eastern Gulf and southern Atlantic Coast States. Southern Alaska is expected to be wet and mild at all periods, while El Niño typically brings subnormal rainfall to the leewards of Hawaii and the Caribbean (Puerto Rico). 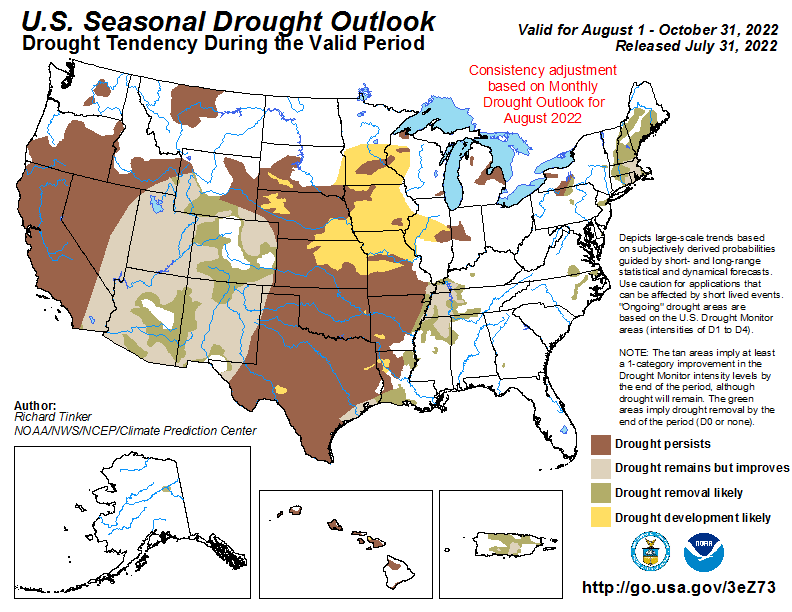 Accordingly, drought should persist or develop in the Northwest, California, and Great Basin, the leewards of Hawaii, and in parts of Puerto Rico, while some improvement is expected in the Four Corners Region, northern and southern Great Plains, southern Florida, and southeastern Alaska. Southeast forecast confidence is moderate to high. Drought was limited to southeastern Florida. It is a fairly dry time of year for the state, but normals year-round are more substantial than in the Plains (where FMA is also a drier time of year), and El Niño development (assuming the atmosphere couples with the ocean conditions) would strongly favor above-normal FMA precipitation as indicated in the 3-Month outlook. Thus drought improvement is forecast. South forecast confidence is low to moderate. Drought (D1) was restricted to small areas in the northern Texas Panhandle and extreme southern Texas. The D1 in northern Texas was long-term while the southern Texas moderate drought was short-term. With the 5-day QPF showing little or no precipitation, ERFs depicting near-normal chances, Weeks 3-4 favoring subnormal rainfall, Feb’19 with equal chances (EC), and FMA tilting toward above normal precipitation, along with the wild card influence of a probable weak El Niño (wet) and a cooler time of year (less evaporation), the odds for improvement slightly outweighed the chances for persistence and development. However, in the short-term, conditions may degrade somewhat before improving later in the period as 60-day precipitation was 25-50 percent of normal in southern and western Texas. Midwest forecast Confidence is moderate to high. There was no drought in this region. All that remained was a small D0 area in northwestern Minnesota, covered under a blanket of snow and frozen in place. After most locations experienced a wet 2018, and are anticipating more moisture in the short-term and extended range, drought development is not expected anywhere. High Plains forecast confidence is moderate. Much of the Great Plains (Dakotas, Nebraska, Kansas) were also drought free with the exception of northern North Dakota (D1). But with the ERFs, Weeks 3-4, and Feb’19 precipitation outlooks favoring above-normal precipitation and near- to below-normal temperatures, along with a moderate blanket of snow currently covering its frozen ground, this water in the bank (snow) should be enough by late April to provide ample moisture to the thawed ground. In the High Plains (Wyoming and Colorado), however, it is a different story as long-term D2-D4 drought lingered in Four Corners Region (southwest Colorado) while short-term D0-D2 dryness/drought has been slowly growing in northern Colorado and southern Wyoming. On Jan. 14, WYTD basin average SWC (precipitation) ranged between 75-95 (80-95) percent of normal, but most of this was due to a good start to the Water Year (wet October and November) and a cold Oct-Dec. It has been rather dry the past 60 days. However, the 5-day QPF, ERFs, Weeks3-4, and FMA’19 favored above normal precipitation (Feb’19 EC), thus some improvement is expected in Colorado and southern Wyoming by late April. Note that improvement in southwestern Colorado may still leave some of this area in D3 or D2. And although some improvement is forecast, the Four Corners Region drought has lasted at least a year, so hydrologic impacts will continue into 2019, but at least this winter has started out favorably. West forecast confidence is low to moderate. Much of the region (over 71 percent) is in dryness or drought (D0-D4) – which includes CO and WY – with D2-D4 drought extending from Oregon southeastward into the Four Corners Region. Most of this drought is long-term, especially the Four Corners Region (more than a year) and Oregon (6-9 months). During the past 60 days, near to below normal temperatures and surplus precipitation has fallen on most of California, Washington, northern Nevada, and parts of Arizona, Utah, New Mexico, and Colorado. January 14 WYTD basin average SWC (precipitation) responded, with most major basins in these areas at 80-115 (75-115) percent of normal. Major California reservoirs have also increased, with levels in central and southern sections of the state (Melones, San Luis, Millerton, Perris, Castaic, McClure, Don Pedro) near or above the historic Jan. 14 average, and northern reservoirs (Shasta, Trinity, Folsom) slightly below the average. Climatologically, the Far West is currently in their wet season (at least Feb and Mar), with coastal California normally recording 20-26 percent of their annual precipitation during February. In the short-term (QPF), a potent Pacific storm system is forecast to drop heavy precipitation (1-6 inches) along the West Coast, on the Cascades and Sierra Nevada, and into the Interior West and Rockies. If this precipitation occurs, some short-term improvements are possible. The longer lead outlooks, however, do not look favorable from the extended to long-range (ERFs, Weeks3-4, 1- and 3-month LLFs) for the Northwest and California. A strong ridge is expected to persist over the West with a deep trough over the East, bringing a good chance for warm and dry weather to much of the West during late January into February (normally a very wet time for California). The FMA’19 outlook is still forecasting warm and dry weather, with the center of greatest subnormal precipitation odds centered over southern Oregon and northern California, and EC over southern California and Nevada. As a result, any short-term improvements to the Far West from this ongoing system may be offset by the dry and warm weather expected through February. The unfavorable medium to long-range forecasts, plus subnormal basin average SWC and precipitation, were also responsible for possible development of drought in the Northwest by late April where D0 currently existed. Chances for above normal FMA’19 precipitation, however, was located over the Four Corners Region and the southern Plains, hence the improvement over this area, but even with improvement, many of these locations would still be in D2 or D3 drought. Plus, the uncertainty with respect to the expected weak El Niño and whether atmospheric conditions couple to the Pacific oceanic conditions later in this period is a wild card. Northeast forecast Confidence is high. There is no drought analyzed anywhere, and although some abnormal dryness is showing up in extreme northern Vermont and Maine, drought development is not expected, especially considering how cold it normally is in FMA and how wet is has been during the past year in much of New England and the mid-Atlantic. Alaska and Hawaii forecast confidence is moderate to high; moderate in Puerto Rico. In southeastern Alaska where normals are extremely high (more than 100 inches), subnormal precipitation during the past 6-12 months has accumulated large deficits and gradually have lowered lake levels used for hydroelectric power generation. Fortunately, all time periods (from 5-day QPF to FMA’19) have favorable odds for above normal precipitation, thus a 1-category improvement is expected. In Hawaii, expected El Niño conditions during FMA should cause subnormal rainfall especially on the leeward sides during the normal rainy season, so persistence and development of drought was depicted for the western sides of the islands. In Puerto Rico, recent dryness has gradually enveloped most of the island with abnormal dryness and a few D1 areas, and the expected El Niño favors subnormal rainfall across the Caribbean (as did the CFSv2), therefore development of D1 was placed where the D0 existed.